Usability is important: for everyone. To make sure your site can be properly used by all your visitors (even if they’re (visually) impaired), you have to optimize your site’s accessibility. Every software developer should at least have some basic interest in this. Well-known WordPress accessibility expert Rian Rietveld has trained both our review and development team and although we’re doing a lot of things right, there’s always room for improvement. With every release, we try to improve our software a bit in terms of accessibility as well. We have an aging population, that much is clear. That growing group of senior citizens is getting more and more familiar with the internet, using iPads and Samsung Galaxy’s to order pizza and book hotels. And set up their own websites. Although we don’t want this, our vision reduces with age. Our website and software need to be accessible for this growing group of visitors. Of course, there are more visually impaired people, think along the lines of (color) blindness and blurry vision. 285 million people are estimated to be visually impaired worldwide: 39 million are blind and 246 have low vision. 82% of people living with blindness are aged 50 and above. Source: WHO. Color blindness (color vision deficiency, or CVD) affects approximately 1 in 12 men (8.3%) and 1 in 200 women in the world (0.5%). Source: Colour Blind Awareness. I’ve checked multiple resources: About 50.4% of the world’s population is male, 49.6% is female. With 7.3 billion people currently living on the planet, that means over 300 million color blind males and over 18 million color blind females. That’s quite a lot of people you’re missing out on when you’re not optimizing your website or software for blind or color blind visitors! I totally get that not all the blind people use the internet and I also understand that not all color blind people need an adjusted website, per se. But it’s really not that hard to optimize your website or software. WordPress has an accessibility team monitoring WordPress. Drupal is working on accessibility. So should you. 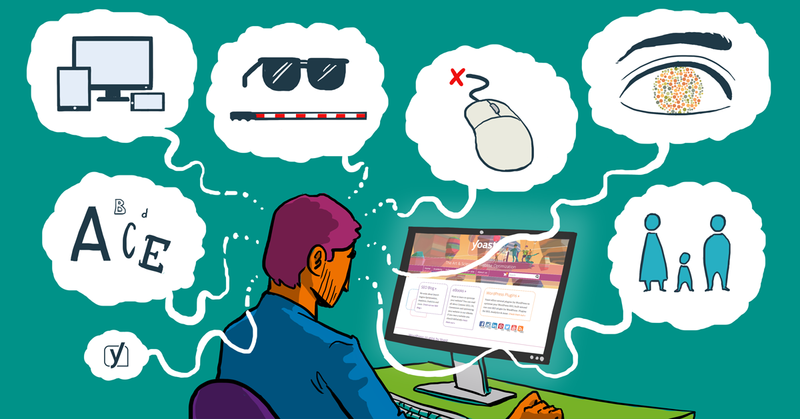 There’s more to accessibility than visual impairment. Less visible (oh the irony) conditions that can cause accessibility issues include for instance dyslexia (and other reading difficulties) and dexterity difficulties. Severe dexterity difficulties mean users are unlikely to use a mouse, and rely on the keyboard instead (Source: Powermapper.com). Have you ever tried to use your website, or our software for that matter, without using a mouse? It’s a tough job, I tell you. And let’s not forget about the deaf visitor that wanted to take our Basic SEO training and was facing over 2 hours of videos without subtitles. It’s quite easy to add these, and so we did. A lot to think about for every website owner, website developer and software developer. And this is just the tip of the iceberg. It’s very likely we’ll follow up on this article with more in-depth information on accessibility. In the meantime, I’d love to hear your experiences in the comments!